ZIMBABWE – Zimbabwean President Robert Mugabe returned home late on Friday after a month-long holiday in the Far East, just over a week after the presidency dismissed rumours that Africa’s oldest president had suffered a heart attack and collapsed. Mugabe, who turns 92 on February 21, is the only leader that the Southern African nation has ever known, and his health is being closely watched in and outside his ruling party, ZANU-PF. The party is deeply divided over who will eventually succeed him. The president was shown on the state television network, ZBC, arriving with his wife Grace and several security aides at Harare Airport, where he was met by one of his vice presidents, Emmerson Mnangagwa, cabinet ministers and security chiefs. 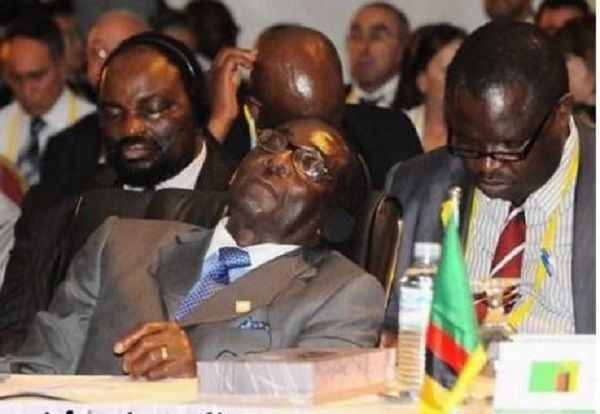 Mugabe did not speak to journalists from ZBC or the state-owned press. .
Reports about the declining health of Mugabe, who is showing signs of his advancing age, are common, but he likes to describe himself as “fit as a fiddle”. On Saturday, Mugabe will meet another long-ruling African leader, Equatorial Guinea’s Teodoro Obiang Nguema, who arrived in Zimbabwe on Friday on a three-day official state visit. In 2014, Mugabe was re-elected to lead ZANU-PF for another five years, automatically making him the party’s presidential candidate in the next general elections, in 2018.